Erickson’s Drying Systems offers full service water, fire, and mold damage cleanup and restoration work in Fort Myers, Cape Coral, Bonita Springs, Sanibel, Captiva, Naples, and across all areas of Southwest Florida (from Marco Island to Tampa). The Erickson’s team handles all aspects of fire, mold, water and flood damage services from first emergency response, 24 hours a day, to personal item recovery, and dealing with your insurance company. What’s more, we are also trained and experienced in handling sensitive trauma and biohazard cleanup, as well as carpet cleaning and tile cleaning. To ensure holistic catastrophe solutions, the team at Erickson’s Drying Systems even offers construction, general contractor services to restore your commercial or residential property back to its original condition. We provide certified mold inspections and full service mold remediation, including the necessary documentation for mold pre- and post-remediation testing. The Erickson’s have 25 years experience serving Fort Myers, Tampa, Naples, Bonita Springs, Sanibel, Cape Coral and all of SW Florida. 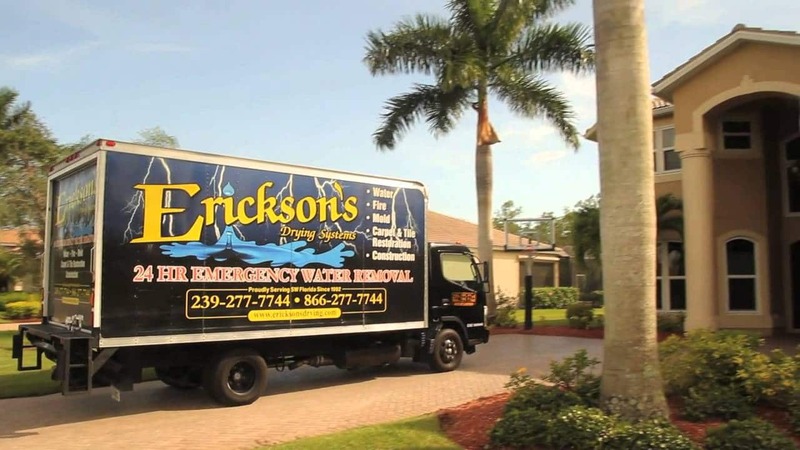 Our team at Erickson’s Drying System strives to meet the needs of customers through a wide variety of solutions such as water removal, mold remediation, and fire damage restoration using state-of-the-art technologies, and the five-star customer service. As a family owned company, we have a vested interest in exceeding our customer’s highest expectations for quality and service. To this end, many of Erickson’s technicians hold multiple certifications from the most prestigious industry certification bodies in the United States. Each of our employees is thoroughly vetted, with comprehensive background checks. We provide extensive ongoing training through online, in-person, and hands-on training opportunities for each team member’s field of specialty.